This phrase is from a parent who turns his strange words into posters. Go ahead and click through on the picture. You are almost guaranteed to find something in this poster gallery that sounds familiar. I am thinking of purchasing this one as I am almost certain I said something like it to at least one of my two children. The context behind the words seems vaguely familiar. "Siri, should I put on my underwear before tattling to mom?" Children just live. They try things, they act on the moment, they observe and absorb. As parents we need to give them nearly constant feedback. They use this feedback to develop rules for living in our world. 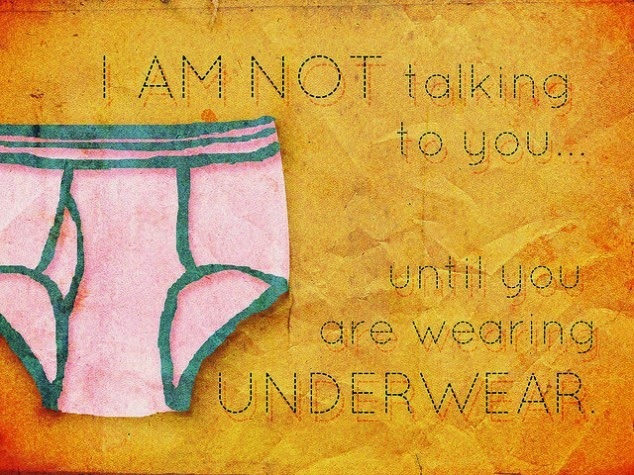 The words about underwear are not actually about underwear - they are about calming down, about prioritizing, about monitoring behavior. Being able to maintain the presence of mind to finish dressing is being able to stay calm and keep a clear head. You will not hurt your children by correcting inappropriate behavior. You will not crush their self-esteem by taking away toys and asking for quiet at a restaurant or in church. You will not scar a child for life if you take him kicking and screaming out of the store. You will not ruin her creative spirit if you insist on technology quiet times. And you will not be seen as a "bad" parent if you demand that your child show respect to others - including you. Instead, you will be showing your children how to live a healthy, happy life. You will be teaching them self-regulation skills that aid in learning. And you will be reinforcing the Word of God that lives in their hearts. Blessings to you as you speak strange words!